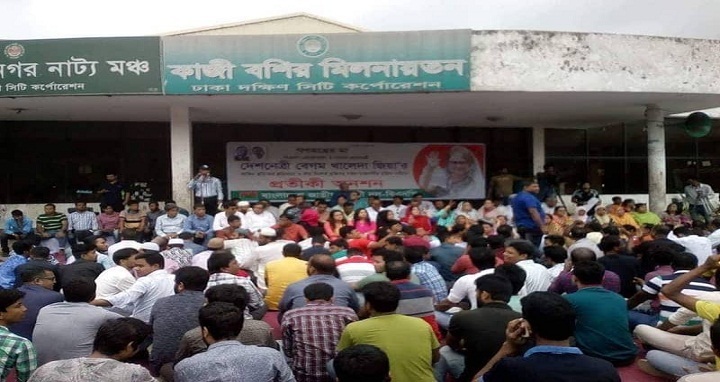 Dhaka, 9 July, Abnews: Dhaka, 9 July, Abnews: BNP has started a seven-hour token hunger strike at Mohanagar Natya Mancha in Dhaka city on Monday protesting the Supreme Court order upholding its stay on bail granted by the High Court to Khaleda Zia in a murder case filed in Cumilla. Leaders, activists of BNP and its associate bodies and 20-praty alliance joined the programme that began at 9am. Leaders of other political parties are scheduled to join the programme to express solidarity. Besides, the similar programme is being held in all district towns across the country. Speaking at a press conference at the party’s Nayapaltan central office, party senior joint secretary general Ruhul Kabir Rizvi on Sunday said police and Dhaka South City Corporation authorities gave their party verbal permission to hold the token hunger strike at the Mohanagar Natya Mancha. On July 2, the Appellate Division of the Supreme Court upheld its previous order staying the High Court order that had granted bail to Khaleda in a murder case filed over the arson attack in Cumilla on February 3, 2015.